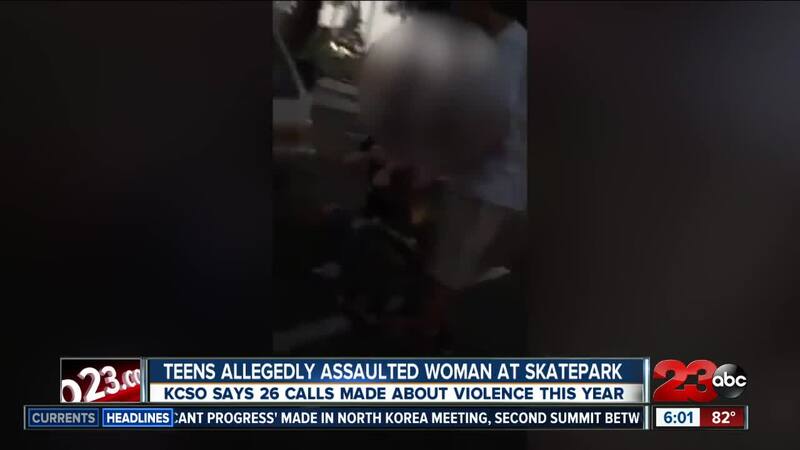 23ABC obtained a shocking video Monday, that shows a woman being attacked by three girls at the new skate park in Oildale Sunday afternoon. 23ABC spoke to the victim's mother, who tells us her daughter had confronted a group of kids after a young boy was hit in the face with a scooter. It was then that she says the group of teens turned on her daughter and began attacking her. The video was captured at the brand new skate park at Beardsley Park in Oildale. The park opened less than a month ago in September. One teen who has visited the park often since it opened - 17-year-old Trevor Walker - told 23ABC that he was there when the fight broke out and you can see him in the video trying to break it up. Walker says the fight on Sunday was not the first one that he has witnessed at the skate park. The Kern County Sheriff's Office says this year they have received 91 calls to Beardsley Park with 26 of those involving some sort of violence or assault. They tell 23ABC they are investigating the incident captured on video Sunday. Tuesday, The North of the River Recreation and Park District released a statement regarding the incident. North of the River Recreation and Park District (NOR) is aware of an incident that occurred in the parking lot at North Beardsley Park on Sunday evening. While the incident is clearly disturbing, it appears it was isolated in nature. It is regretful the family involved had this unfortunate experience at one of our parks and we are thankful that serious injuries did not happen as a result. It is NOR’s understanding law enforcement was contacted during the incident and that a report has been filed. As this is in the hands of law enforcement, we will allow the legal process to proceed to its conclusion without further comment. Park safety is a priority for NOR. Despite our diligence, there always remains the possibility individuals who do not value the safety of our families in the same manner as we do, will do things that are unlawful and dangerous. We encourage everyone to be aware of their surroundings and immediately report any safety issue to law enforcement and/or an NOR Park Ranger. One of the girls seen attacking the woman in the video, Shyanne Thieman, approached 23ABC and said she wants to apologize for what she did. "I'm sorry and it should have never happened... and it's not going to happen again, at least not from me," said the thirteen-year-old. KCSO asks anyone with information about Sunday's incident to contact them at 861-3110.